I’m on vacation for the holidays and I’m finally getting some time to play video games. I’ve got an Xbox One X that is my primary machine, and I also have a Nintendo Switch that is a constant source of joy. I recently also picked up a very used original PS4 just to play Spider-man but expanded to a few other games as well. One of the reasons I end up using my Xbox more than any of my other consoles is its support for Backwards Compatibility. Backwards Compat is so extraordinary that I did an entire episode of my podcast on the topic with one of the creators. The general idea is that an Xbox should be able to play Xbox games. Let’s take that even further – Today’s Xbox should be able to play today’s Xbox games AND yesterday’s…all the way back to the beginning. One more step further, shall well? Today’s Xbox should be able to play all Xbox games from every console generation and they’ll look better than you imagined them! The Xbox One X can take 720p games and upscale them to 4k, use higher quality textures, and some games like Final Fantasy XIII have even been fully remastered but you still use the original disc! 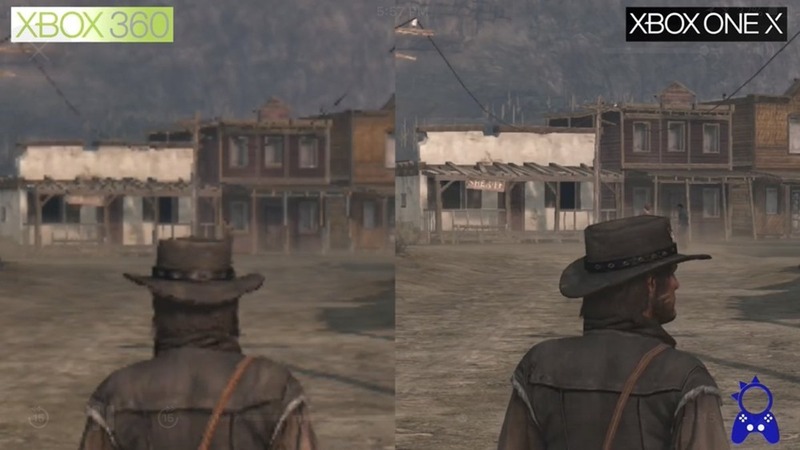 I would challenge you to play the original Red Dead Redemption on an Xbox One X and not think it was a current generation game. I recently popped in a copy of Splinter Cell: Conviction and it automatically loaded a 5-year-old save game from the cloud and I was on my way. I played Star Wars: KOTOR – an original Xbox game – and it looks amazing. A little vacation combined with a lot of backwards compatibility has me actually FINISHING games again. I’ve picked up a ton of games this week and finally had that joy of finishing them. Each game I started up that had a save game found me picking up 60% to 80% into the game. Maybe I got stuck, perhaps I didn’t have enough time. Who knows? But I finished. Most of these finishings were just 3 to 5 hours of pushing from my current (old, original) save games. Crysis 2 – An Xbox 360 game that now works on an Xbox One X. I was halfway through and finished it up in a few days. Crysis 3 – Of course I had to go to the local retro game trader and pick up a copy for $5 and bang through it. Crysis is a great trilogy. Dishonored – I found a copy in my garage while cleaning. Turns out I had a save game in the Xbox cloud since 2013. I started right from where I left off. It’s so funny to see a December 2018 save game next to a 2013 save game. Alan Wake – Kind of a Twin Peaks type story, or a Stephen King with a flashlight and a gun. Gorgeous game, and very innovative for the time. Mirror’s Edge – Deceptively simple graphics that look perfect on 4k. This isn’t just upsampling, to be clear. It’s magic. Metro 2033 – Deep story and a lot of world building. Oddly I finished Metro: Last Light a few months back but never did the original. Sunset Overdrive – It’s so much better than Jet Set Radio Future. This game has a ton of personality and they recorded ALL the lines twice with a male and female voice. I spoke to the voiceover artist for the female character on Twitter and I really think her performance is extraordinary. I had so much fun with this game that now the 11 year old is starting it up. An under-respected classic. Gears of War Ultimate – This is actually the complete Gears series. I was over halfway through all of these but never finished. Gears are those games where you play for a while and end up pausing and googling “how many chapters in gears of war.” They are long games. I ended up finishing on the easiest difficulty. I want a story and I want some fun but I’m not interested in punishment. Shadow Complex – Also surprisingly long, I apparently (per my save game) gave up with just an hour to go. I guess I didn’t realize how close I was to the end? I’m having a blast (while the spouse and kids sleep, in some cases) finishing up these games. I realize I’m not actually accomplishing anything but the psychic weight of the unfinished is being lifted in some cases. I don’t play a lot of multiplayer games as I enjoy a story. I read a ton of books and watch a lot of movies, so I look for a tale when I’m playing video games. They are interactive books and movies for me with a complete story arc. I love it when the credits role. A great single player game with a built-up universe is as satisfying (or more so) as finishing a good book. What are you playing this holiday season? What have you rediscovered due to Backwards Compatibility?